Sheep Dog Session at Good Day Out Experience Days01874 749092work ExperienceSet on a beautiful Welsh Hill Farm between Brecon and Crickhowell in the Brecon Beacons National Park, this great experience gives you insight as to how the farmer works with his dogs to move his livestock around the farm. You will walk around the fields, checking the sheep and moving them where necessary and learning some of the basic commands, then have a go at commanding the dog yourself! 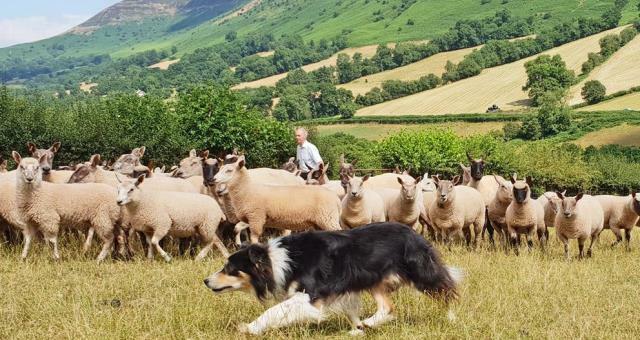 Set on a beautiful Welsh Hill Farm between Brecon and Crickhowell in the Brecon Beacons National Park, this great experience gives you insight as to how the farmer works with his dogs to move his livestock around the farm. You will walk around the fields, checking the sheep and moving them where necessary and learning some of the basic commands, then have a go at commanding the dog yourself! The experience lasts 90 minutes including light refreshments, and is within very small groups. Other dates can be requested for special group bookings mid-week. Specific dates from June to August 2019, plus mid-week group bookings can be requested. Pre-booking required. £25 per person. Not suitable for younger children.